The parathyroid glands are small endocrine glands that are central to the regulation of the concentration of calcium in the blood. They are rather shy, secretive organs which have the distinction of being the only organ (with the exception of the atrophied thymus in adults) that is awkward to find at surgery or post mortem. The parathyroid glands are situated in the neck, behind the thyroid gland, although pararthyroid tissue can sometimes be found within the thyroid gland or in the mediastinum. The usual number of parathyroid glands is four (right superior and inferior, left superior and inferior), but this can vary. 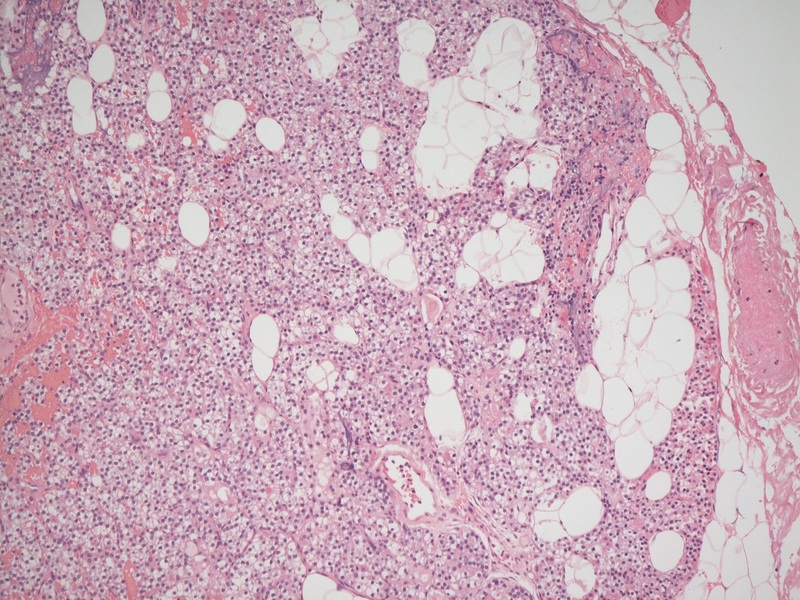 The rather variable position of the parathyroid glands does not facilitate finding them at surgery or post mortem (in the latter case a rule of thumb is that if the parathyroid glands are not easily found, they are neither hyperplastic nor neoplastic). This problem is exacerbated by their diminutive stature. Each parathyroid gland weighs 35-50mg, while their maximum linear dimension is in the region of 10mm. The glands are ovoid and their yellow-brown colour blends rather easily with the appearance of adjacent tissues. The parathyroid glands are supplied by the inferior thyroid artery. The parathyroid gland possesses a thin, fibrous capsule. Most of the gland is formed by chief cells which are polyhedral, 12-20micrometres in diameter and have a central nucleus and clear to palely eosinophilic cytoplasm. The chief cells produce parathyroid hormone. The other specialised cells are the oxyphil cells. Oxyphil cells are much larger than the chief cells and have stronly eosinophilic cytoplasm. Their nucleus is smaller than that of the chief cells. The function of the oxyphil cells is unknown. The parathyroid gland also contains mature adipose tissue. The proportion of mature adipose tissue increases with age. 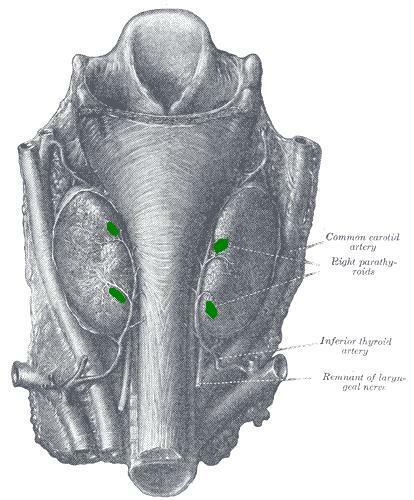 The embryological development of the parathyroid glands is from the third and fourth pharyngeal pouches. The superior glands arise from the fourth pouch, which is actually located inferiorly to the third, which gives rise to the inferior glands. The pairs of glands move relative to each other to attain their typical positions. The parathyroid glands release parathyroid hormone in response to a low blood calcium level. The functions of parathyroid hormone are discussed in the section on calcium metabolism.